Heat oil in a large pan over a medium heat. Add the bell peppers, roma tomatoes, broccoli, mushrooms, onion, carrots and zuchinni. Cook until tender and juicy. Set aside. 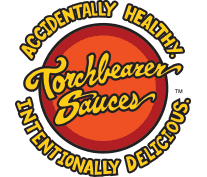 IF you are using TorchBearer Sauces, this would be the best step to add it. in a small frying pan blanch the spinach until it is very soft. mix the ricotta and cottage cheese together, adding some basil, oregano, any other spices you prefer into the mix. Now add half of the Parmesean to the mix as well. Finally mix in the spinach you have blanched and stir til nicely mixed. Put 1/3 of the ricotta mix on the bottom of the pan and top it with 1/3 of the veggies. Now put a layer of noodles and repeat 2 more times. If there is anything left over when you get to the 3rd layer of noodles add it to the top of the lasagna and put the rest of the mozzarella on the top. place the pan in the oven and bake for 35 minutes. Receive special offers by subscribing to our email list!